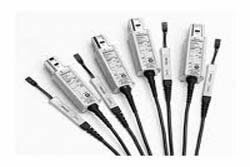 1For details, please see application note 60W-18344-0, ?Making Single-ended Measurements with Differential Probes.? Tektronix created the Z-Active probe architecture and set the industry benchmark for signal fidelity. Tektronix active probe architecture preserves high bandwidth while providing improved connectivity with low loading and low noise. The Z-Active architecture is a hybrid approach composed of a distributed attenuator topology feeding an active probe amplifier. The Z-Active probes use a tiny passive probe tip element that is separate from the amplifier, extending the usable reach of the probe. In traditional active probes, adding this much length can introduce signal fidelity problems. However this architecture maintains high DC input resistance and presents a higher AC impedance than other probe architectures. It accomplishes this while providing significant length between the probe body and the probe attachment point to the DUT. This architecture provides the best of both worlds: high DC impedance like existing active probes and the stable high-frequency loading of Z0 probes. Circuits designed for low power consumption can operate in unterminated modes with high impedance. Probing these buses in low power mode requires a probe with high impedance at low and medium frequencies. The Z-Active probes provide high impedance inputs that minimize the probe's loading on low power circuits. Many of today?s logic signals and serial bus signals require the capability to measure up to several volts peak to peak. These voltage levels may easily be viewed with the Z-Active architecture probes (P7380A, P7360A, and P7340A) with the extended linear dynamic range. With a 2.0 Vp-p linear dynamic input range at the 5x attenuation setting, you can accurately measure MIPI D-PHY and C-PHY, LPDDR2 and LPDDR3, and PCI-Express signals at reduced noise levels. In addition the 25x attenuation setting?s linear dynamic input voltage range can be used up to 5.0 Vp-p for accessing even larger signal swings found during transition times. The Z-Active probe design allows the probe to easily switch between soldered, handheld, or fixtured applications. This family of probes uses Tip-Clip? assemblies, an interchangeable probe tip system that enables engineers to configure their probe with the optimal tip for their application. These detachable assemblies make it possible to replace a tip for a fraction of the cost formerly associated with such hardware changes. Tip-Clips are available in several lengths and with variable tip spacing to provide flexibility for adapting to vias and other test points of differing sizes. With Tektronix Tip-Clip assemblies, Monday's solder-in probe can become Tuesday's handheld tool, simply by switching tips.